When I looked back prior to IMTX at the training I had done this year, the data showed that I’d done a lot more easy riding than in past years. That was supported by all metrics, but seemed most dramatically revealed by how far I had ridden. But one thing I didn’t think about at the time was that I’ve done a lot more riding in my garage than ever before. I’ve enjoyed some hard workouts on Zwift, but I’ve also done a lot of my easy spins on the trainer. I thought this might be a necessity with the largest El Niño in close to 20 years, but – unfortunately – we didn’t actually end up with all that much rain. I did have a few days where I was forced inside by torrential downpours, but plenty of days I just chose to ride inside. While my accident is long enough past that it’s not at the forefront of my mind most days, I am not ashamed to admit that I’m still scared a little every time I ride my bike. I think that’s a healthy fear. It’s the kind of fear that keeps you focused and keeps you safe. But it can make a short, easy ride less relaxing that it ought to be. The roads around my house are great for training, but the best riding starts about 30min away. So for a short ride of 60 or 90min (and, yes, I do plenty of those), I found it was easier to just hop on the trainer. In doing so, I was reminded that you can also get some pretty solid workouts in as well. It’s a lot easier to control your power when you don’t need to worry about anything else, though I think that has its downsides too, since you need to be able to execute when you are outside and do have to contend with weather, topography, and everything else. In the past, three things had really kept me from riding inside. The first, and this is still the thing that gets me on my bike most days, is that I just love being outside. Nothing will ever change that. I love being a triathlete because I love being outside. I do have to balance this, when biking, with the fact that I really do not love riding around cars, and as I get older (and my kids get older), I guess I appreciate more that rides indoors are inherently safe. That’s a change. Priorities change, at least some of the time. But deciding to ride indoors has also been made easier by addressing the two other big obstacles that kept me from riding inside. The second thing was that riding inside is, I think, pretty boring. The endless array of movies and TV shows now available on iTunes (or Netflix or Amazon Video or any of the other options out there) helps a lot here. Way better than just hoping something entertaining is on. Or watching the same movie again, and again, and again… But it’s also been helped by programs like Zwift (and, I guess, TrainerRoad and some others, though I’ve not used those) where you actually can make the experience of riding inside more engaging rather than just seeking out more and more distractions. The final obstacle was that I found riding on a trainer really uncomfortable. On a treadmill – which I generally mind much less than riding a trainer, you get to move. While the mechanics are slightly different, running on a nice treadmill feels a lot like running outside. But on a trainer, the bike doesn’t move. I find that the same position that I can ride comfortably for hours outside is substantially less comfortable inside with the bike fixed rigidly underneath you. Saddles that never give me numbness outside seem to always give me numbness on the trainer. I find I am just way more “fidgety” on a trainer. And I’d say that, more than anything else, was really the thing that kept me from wanting to ride inside. I had tried rollers before, but as someone who came to cycling relatively late in life and who also does a lot of my riding on my TT bike, I just always found rollers to be an accident waiting to happen. For people that can ride rollers well, they are great. But for me, I just found it to be even more nerve wracking than riding outside. And, of course, I found that rollers were not great if you want to do really hard efforts. The feel of riding on rollers is wonderful, but there were a bunch of other drawbacks. In general, it seemed like there were a lot of things that might have made riding inside okay, but no one thing that would really solve all of the things I didn’t like about it. 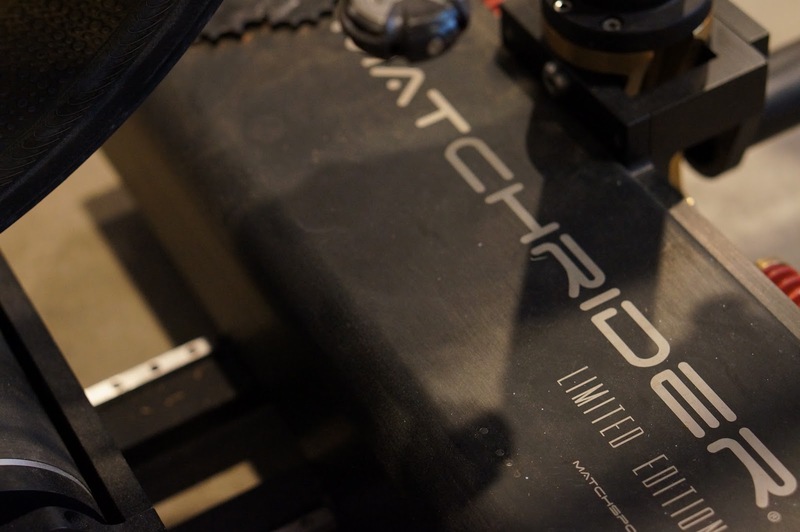 The Matchrider is a premium indoor riding experience. It’s about as close as you can get to those “indoor bicycle treadmills” without needing to build an entirely room just to house it. 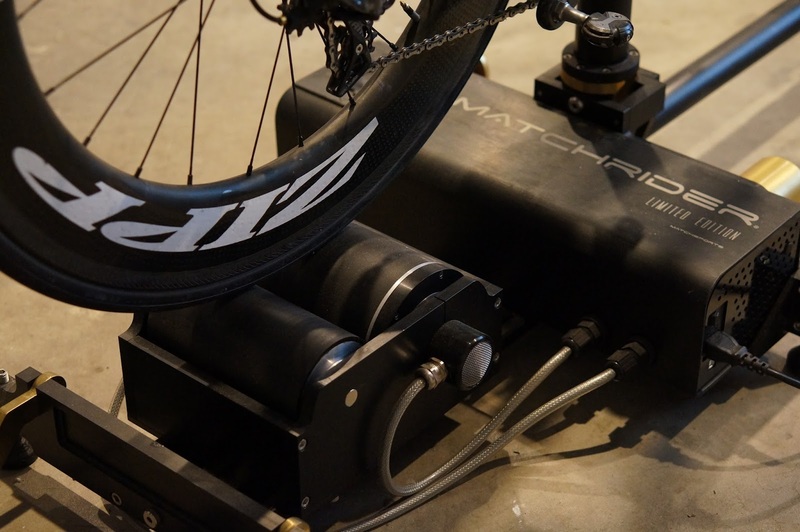 The Matchrider allows the bike to move, realistically, underneath you, while still offering the stability of a traditional trainer. It offers an incredibly realistic road feel, with a sophisticated electronic flywheel that allows you to ride the same way you do outside – from coasting to sprinting and everything in between. The Matchrider tossed out everything about how trainers had traditionally been designed and started from the ground up. There’s really a ton more great information at matchsports.com/matchrider, but here are my thoughts on the product and what I think makes it so revolutionary. The Matchrider uses a unique system of rubber supports that bolster the frame under the bottom bracket and downtube, with a soft-fabric strapping system to minimize stress on frame while still providing support. The Dimond cannot be used on a traditional trainer that fixes the rear axle, so this was essential for me. But for any bike, the Matchrider puts the same sort of stress on your frame that riding on the road does. It’s this support system that allows the Matchrider to provide unprecedented freedom of movement within a stable platform. The bottom bracket is supported by a cradle with a spring-loaded stability platform. Using the Matchrider’s software, you can adjust the stability from fully rigid to totally free, all while still being able to depend on lockouts at 4deg. Bike moves under you, just like on the road. But, unlike on rollers, it won’t let you fall over. This allows for more natural for riding. It allows you to move on your bike the way you want to move. For triathletes, that translates into a more comfortable experience running off the bike. Well, at least as comfortable as running off the bike ever is. Because your bike mounts with both wheels on, the Matchrider adapts to fit any bike. 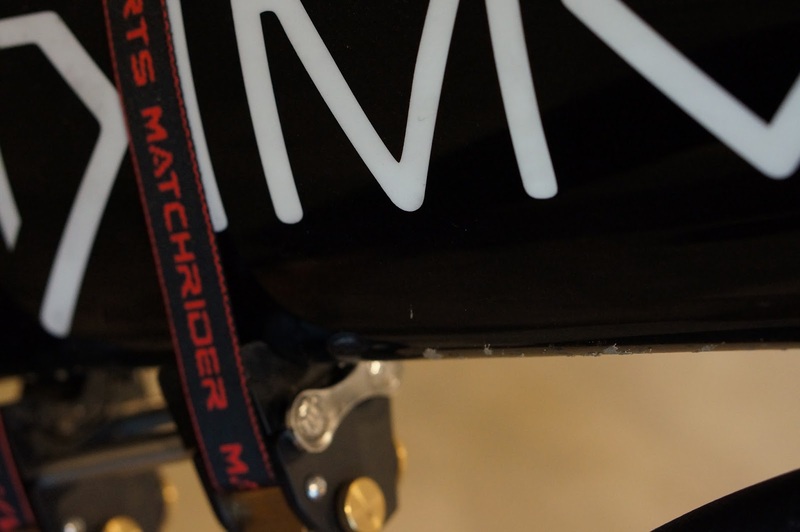 The Matchrider supports the bike at both tires and then under the bottom bracket, three things which every bicycle has. The rear rollers adjust with a simple 5mm hex key to adjust for your chainstay length. It’s quick and simple. One drawback of riding inside is that trainers can eat tires. The Matchrider uses a soft (relatively) polymer for tire, that doesn’t burn it up. 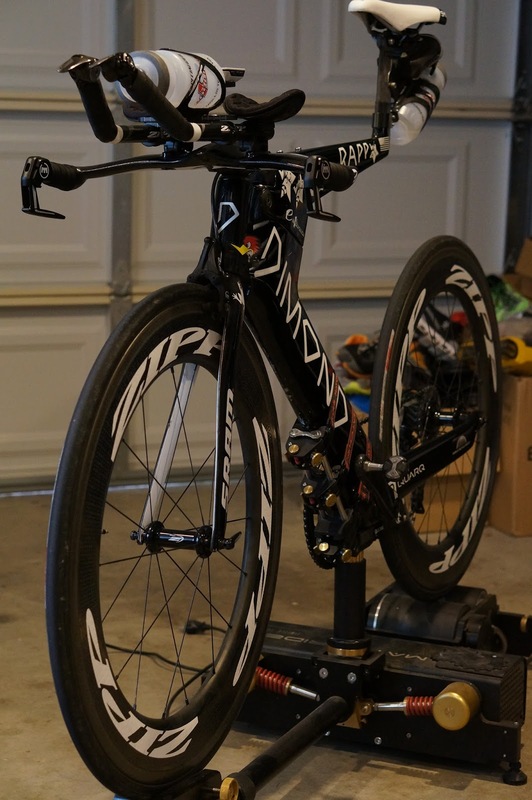 And with force being applied, like with a bike on rollers, simply due to bodyweight, you won’t need to swap your tires out to ride the trainer or risk balding the tire you prefer to ride outside. You can leave your bike exactly as is on the Matchrider. But unlike rollers, the Matchrider can dynamically change resistance. 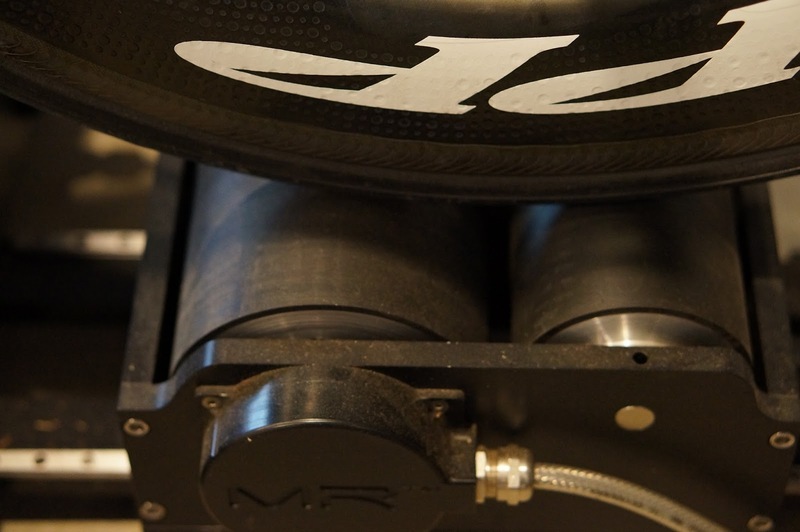 The electronic flywheel system of the large diameter rollers (much larger than any other trainer or roller out there) at 500Hz, so it disengages immediately if you want to coast – and your bike will freewheel just like it’s on the road, maybe even longer – and then re-engages without missing a beat when you put power to the pedals. The drop-off and re-engagement is lightning fast. There’s none of that lag and heaviness that can accompany riding a trainer. For a triathlete who’s used to doing steady efforts, this is nice. But for a roadie who needs to train the constant on/off of road racing, it’s fantastic. I’m not going to talk too much, because this is the area that’s undergoing the biggest changes. Matchrider will allow you to compete against existing files – either your own or others – including with video overlay as an option. 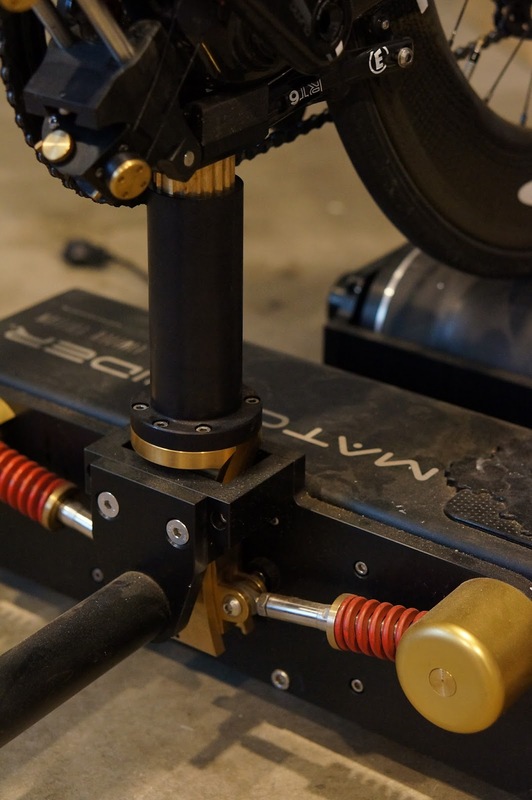 But it will also support the traditional erg mode, allowing you to use the Matchrider’s internal resistance curve or to set the resistance to a given wattage level that the flywheel will adjust to keep steady. And there’s going to be support for preplanned interval workouts. With both Bluetooth and on-board USB, the Matchrider has plenty of options for data input and output, and I’m the most excited to see where the UI/UX goes in this year and the next. It will come with both iOS and Android apps for control. And you can expect even more. A lot of folks also know about my passion for supporting domestic manufacturing. While the Matchrider is not Made in USA, it is made in Melbourne, Australia. Supporting real manufacturing jobs and real engineering jobs is something that matters to me. If it matters to you, great. One more thing to recommend the Matchrider. If that’s not something that matters to you, that’s okay too. But hopefully being able to pick up the phone or to write an email and to connect with the actual folks who put this thing together might prove it’s value down the line. The Matchrider lists for $4,200 for the limited edition “Model 0” which will come with a bunch of extras including a lifetime warranty. I realize that big sticker prices often get a lot of attention. Price is a funny thing, and I try not to get into the idea of “value” or “worth” too much. Is the Matchrider worth $4,200? Yes, I believe the quality of the product and of the engineering and development and manufacturing justifies that price. Does that mean it’s worth it to you? That’s not for me to say. That’s a personal decision. I’m happy to answer any questions I can in the comments or on Facebook or via email. I wrote this on Facebook in response to what was a hard criticism that this post didn’t sound “like me.” I wrote 100% of this, but I suppose I’m not much of a pitchman naturally (for better and for worse), and that maybe it came out sounding less genuine than some things I’ve written. The hard part about something like this is that there’s no direct correlation to race day. It’s not something that I ride during the race. It’s obviously way too big to bring to races when I travel. And, fundamentally, I love riding a bike because I get to be outside (most of the time). So it’s hard to talk about the places I get to see while riding this. Or the way in which it makes a particular difference on race day (like a bike, or a tire, or nutrition, or sunglasses, or a wetsuit, etc, etc). The engineering of this product is phenomenal. But it’s also tough to explain. How do you split the difference between talking about how a 500Hz sampling rate affects engagement and talking about hard to pin down concepts like “feel.” I don’t like selling things, in general. I think it’s the worst part of my job. But I also love working with creative, smart people who are trying to do something different. Some products are really easy to talk about. Like 1X. 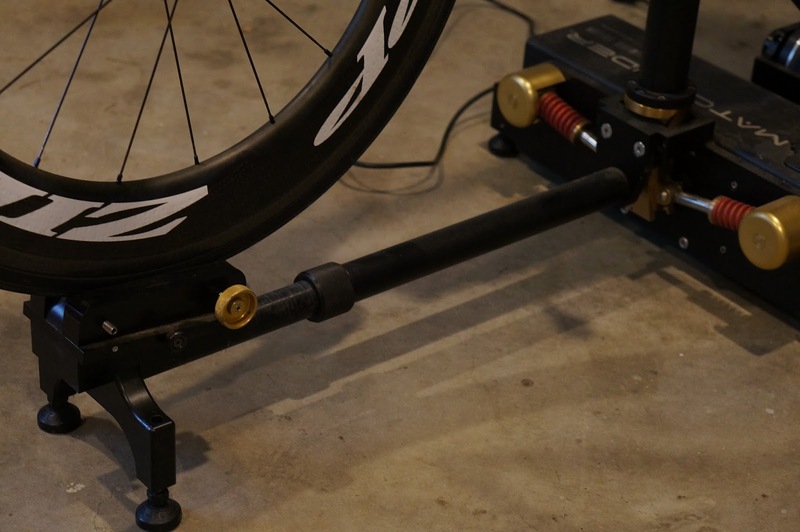 But as someone who really does enjoy riding outside (I’d quit the sport before I became one of those guys who does 100% of their training indoors), I view a trainer as a useful tool and as an (occasionally) necessary evil. Maybe it would have been more “me” to write something like, “I hate riding inside, but I also hate cars buzzing me or honking at me or swerving too close to me even more, so I’ve started to ride indoors more than I used to. 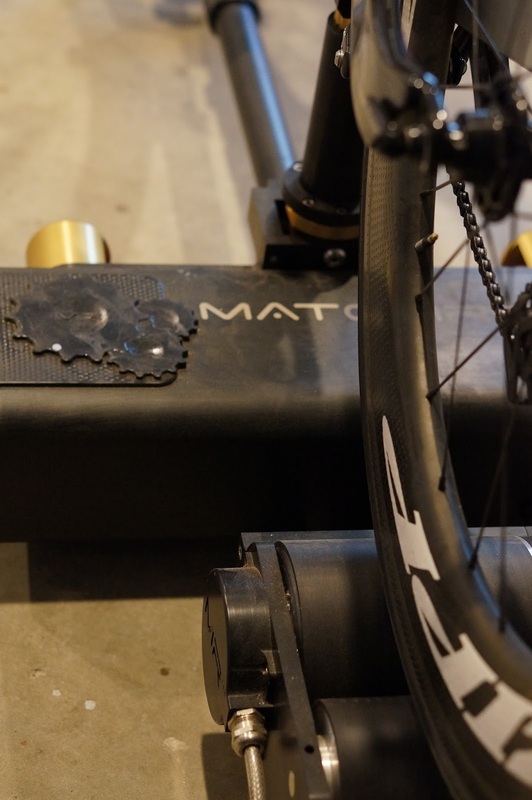 And while riding inside is never going to be as much fun as riding outside, the Matchrider is pretty dang good thanks to some clever engineering.” I don’t know… I knew people were always going to give me flack because $4,200 for a trainer is a lot. I get that. But I believe in the product and, even more, the folks behind it… So I tried to write something that would show that belief. Apparently, in at least one case, I didn’t measure up. Anyway, I just wanted to add this in because I value the trust that folks put in me to be honest more than anything else. The marketing side of professional sport always has – and probably always will – make me a bit uneasy. There’s nothing – absolutely nothing – that cuts me more than when (typically o Slowtwitch) – someone calls me a, “shill.” Do some of the products I support have flaws? Yes. They ALL have flaws. Do I try to highlight the positives? You bet. But I always try to be genuine. This is a tough sport to make a living in, and to support a family by. I’m sure I’m biased by the support of those who make it all possible for me. But I also try really hard to stick to my guns. I’ve worked with some companies where I did not love the product as much as I should have. I’ve also walked away from relationships where I was asked to say things or do things to endorse a product that I simply did not feel was right, even though it cost me – and my family – a lot. This is a great product. But it’s also one – at least on the software side – that’s very much still evolving. And it’s expensive. It’s definitely not for everyone. Anyway, I hope if you’re interested that you might consider checking them out. If the price makes it not right for you, that’s fine. More than fine. But please at least take the time to consider that they are just something better and different and to see some value in that. Thanks.